1st September is International Primate Day, established by Animal Defenders International to highlight the threats to and abuses of our closest relatives in the animal kingdom – the apes and monkeys. In nature these intelligent, social animals generally live in complex societies, where they communicate and show compassion. But in the name of entertainment primates suffer terribly, with infants torn from their mothers for training, and often enduring social isolation and deprived conditions. Chimpanzees and monkeys suffer as they are turned into figures of derision dressed in clothes and forced to entertain people – actions which can undermine serious conservation efforts and even stimulate demand for animals to be snatched from the wild because people see these animals as amusing playthings. ADI has revealed evidence of chimpanzee exploitation at a German amusement park. We visited Schwaben Park to view the treatment of chimpanzees used in its ‘Schimpansen Show’ and documented chained and collared chimpanzees wearing shorts, who were made to ride a tricycle, balance on a ball and jump over hurdles. 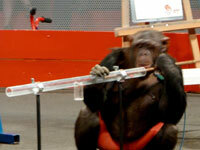 ADI is calling on Schwaben Park to cease its shows and retire the chimpanzees. Please help - see action point below. There is nothing amusing about animal suffering and there is absolutely no justification for the use of primates in any form of entertainment. 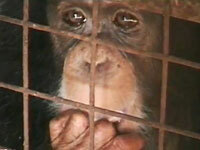 HELP US END THE USE OF PRIMATES IN ENTERTAINMENT! Email Schwaben Park here to politely express your disgust and urge them to stop their demeaning shows and retire the chimpanzees. Thank you for supporting International Primate Day.